Titanium Backup is one of the most popular apps on the market for some time, and with good reason. 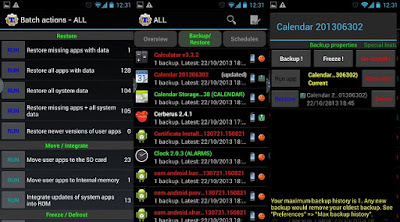 It can be used to backup all your important application data, system data, and even WiFi passwords on you android smart phone. &nbsp;If you’re planning on removing apps using your newly found root permission or are planning to install custom versions of Android Rom, then backing up your your applications and data&nbsp; is really important. 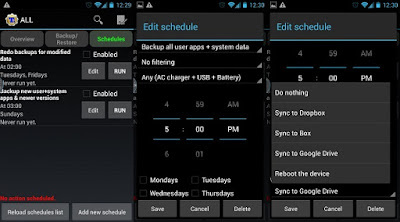 &nbsp;First things first, you’ll need a rooted handset before you can use Titanium Backup. Following that the app will need to be granted root permissions on your phone, but that’s simple enough. You’ll be prompted by Superuser once you run Titanium Backup, and can select to give it permanent access so you won’t be prompted again. If you’re using Titanium Backup to restore apps in after installing custom&nbsp; ROMs DO NOT attempt to restore system apps or their data across ROMs, as this will cause all sorts of crashes. Individual apps work fine, but system data will be incompatible. Now that everything is setup we can begin. 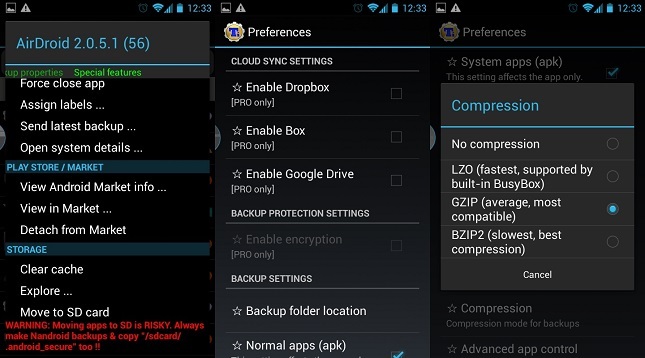 At first glance, Titanium Backup doesn’t appear to have the friendliest looking interface, the black and grey theme could certainly use a makeover. But don’t let that put you off, everything you need is actually very easy to find. Frustratingly though, probably the most useful tool for performing a mass backup is actually hidden in another menu, rather than on the Backup/Restore tab where you’d think it would be. Instead, click the Menu button on your phone, and then select the “Batch actions” option under the “General” section, it should be the second option on the list. Batch actions can be accessed from your devices menu button, or via the icon in the top left of Titanium’s home screen. 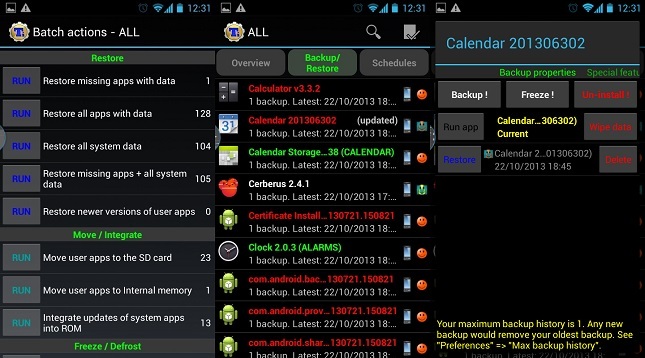 The all-important backup section is located right here, giving you a wide variety of options regarding app and system data. System data includes Bookmarks, WiFi information, calendar events, etc. If you’re performing a backup for the first time then want to use the “Backup all user apps + system data” option, or at the very least the “all user apps” function. Clicking “Run” will present you with several more options to refine exactly what you’d like to backup. Once you’re satisfied with the selection, tap the green tick in the top right to begin the backup. Patience is the key here as this can take a while, especially if you have lots of large apps installed. 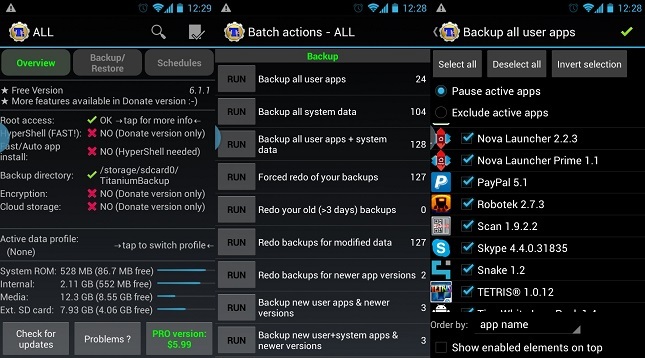 If you’ve performed backups in the past and simply want to make a backup of newer apps you’ve installed recently, the “Backup new user apps” option on the “Batch actions” menu is the best choice. Alternatively, you can use the “Backup/Restore” tab on the Titanium homepage to select individual apps to backup. Generating a backup every time you install a new app is a bit of a pain, and it’s unlikely that anyone will remember to make a backup every week or month anyway. Fortunately, Titanium Backup now includes a scheduled backup option. Over on the main menu tap the “Schedules” tab and you’ll be presented with two options. 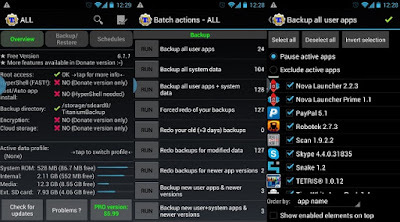 The first choice labelled “redo backups for modified data” will schedule backups only for app data which have been changed since the last backup. This could include games or changes make to specific app data. The schedule has plenty of options to control automatic backups, so you don’t have to mess around with Titanium regularly. 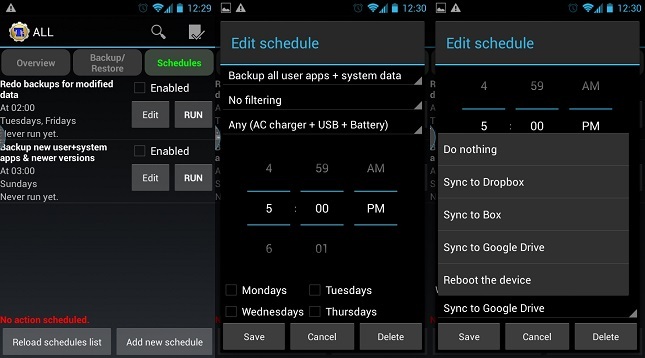 Alright, you’re protected in case your android device suffers a minor meltdown, but the next important step is being able to restore your apps and settings incase anything goes wrong. In the batch actions, yet again, you’ll find a list of options for mass restoring your data. “Restore missing apps with data” will replace any content that is missing from your handset after a wipe. Alternatively restoring all apps with data will replace any existing apps with the backed up versions of them created earlier. There’s also a rather helpful option to only restore newer versions of user apps if you’re reinstalling your system. However, the option that’ll you’ll most likely be interested is the “restore missing apps + all system data” option, which will put everything back to where it was when you created the backup. Although I can’t stress enough, that system data shouldn’t be restore if you’re custom ROMs. Batch and individual restores can both be performed. There are also some additional commands when looking up the options for each app. If you discover that a specific app has developed a fault, say after a bugged update, and you want to restore it to a previously saved version, then this can be done by clicking on the backup/restore option on the main page. Here you can pick the specific app or piece of data from the list. Once tapped, a list of backups will appear along with a list of other functions to create backups, etc. Here you can manage your individual app backups, or can restore the app to a specific date by clicking on the corresponding restore button. That’s the really important stuff out of the way, but Titanium backup includes plenty of additional advanced features if you want to make the most out of your backups. Slower compression will save on storage space, but be prepared to wait a little while while backups are performed. &nbsp;ifyou’re short of internal memory storage, there’s also the option to move apps to the SD card. However, this will cause certain apps to malfunction, so it’s only recommended to use on software which don’t integrate closely with any other part of Android, such as games. 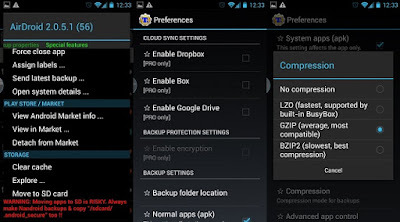 Titanium Backup features many more options under the configurations menu, including tweaks to the type of compression used to create backups, the maximum number of backups to keep for each app, and whether or not to store market links for apps. In fact, apps can even be disconnected from the marketplace, so automatic updates can be left on for apps but then manually disconnected for certain apps, if you so desire. so if you have any other problem, kindly use the comment box below and dont forget to share this post.